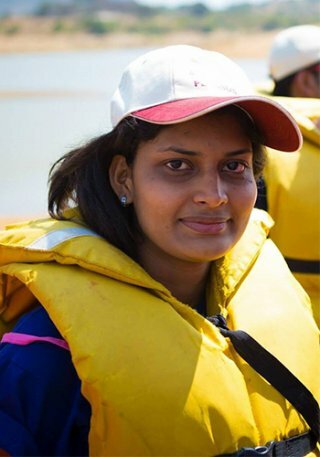 Honours programme student Preethi Lahoti conducts research in graph mining and social-networks analysis. Exceptionally qualified Master’s students have joined the honours programme in computer science. Altogether 15 Master’s students from all over the world will have hands-on experience in the actual computer science research. Majority of the honours programme students are specialized in the machine learning, data mining and probabilistic modelling research area. Preethi Lahoti feels very privileged to be part of the Data Mining research group led by professor Aristides Gionis for the second year already. She conducts research in graph mining and social-networks analysis. “We have undergoing research with Aristides Gionis and Gianmarco De Francisci Morales, as we study the problem of finding topic experts in large graphs. This research is part of a Tekes project on managing personal data”, describes Lahoti. Lahoti had a research internship at Nokia Bell Labs in Dublin during the summer of 2016. She conducted research in Data analytics team in text mining, focused on designing efficient algorithms for computing text similarity measures. Results of the research were accepted as a paper “Efficient Set Intersection for Text Similarity Measures” in a top algorithms conference, ALENEX 2017. “We also submitted a patent for a device for guided discovery of people with similar interests. The patent of the device is currently in the process of filing”, adds Lahoti. Lahoti has been actively been involved in the social media, for instance in Quora she answers questions related to machine learning and studies at Aalto University. Lahoti also participated in womENcourage 2016 conference, intended to encourage women in computing, and she also acts as a teaching assistant for the machine learning and data mining students. Oleksii Abramenko and Ivan Baranov from Ukraine, Shishir Bhattarai from Nepal, Mustafa Celikok from Turkey, Kunal Ghosh and Preethi Lahoti from India, Alexandru Mara from both Spain and Romania, Van Linh Nguyen from Vietnam and Siddhart Ramchandran from India all study different aspects of machine learning, data mining and probabilistic modelling. Rinu Boney from India specializes in computer vision, Rory How from the UK studies cloud computing, Xiaoxiao Ma from China participates in game research, Hannu Seppänen from Finland looks into the digital disruption of the industry, and Rajagopalan Ranganathan from India together with Manish Thapa from Nepal are part of the secure systems research group. T building: Aalto University, Otaniemi campus, Computer Science building, Konemiehentie 2, 02150 Espoo.